This modelling, morphing synthesiser makes its intriguing new technology easy to use - perhaps too easy, in fact - sounds great and comes in at a very agreeable price. Intuitive interface. New and interesting synthesis technique. Good presets with more available. Can't create tone colours. Parameters are almost too basic. Lacking in the modulation department. For all our kvetching over the years about the constant stream of predictable emulative synthesisers making it to market, we're very happy to be able to say that the road less taken has actually seemed a little crowded of late, with the arrival of interesting and unusual instruments like Humanoid Sound Systems' Enzyme and Madrona Labs' Kaivo. 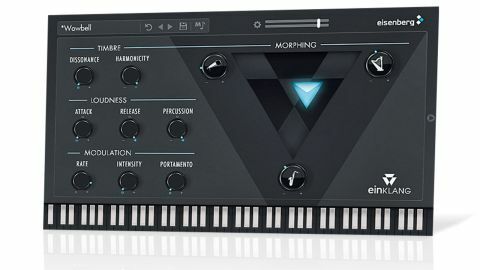 New German developer Eisenberg has joined the unorthodox caravan with its new cross-platform synth, Einklang (VST/AU/RTAS/AAX/standalone). "The idea is that complex functions can be manipulated using a handful of simple, intuitive and musical parameters"
Einklang is built on the company's proprietary AIST, which stands for Artificial Intelligence Studio Technology. The idea is that complex functions can be manipulated using a handful of simple, intuitive and musical parameters. Based on spectral models, Einklang's behaviour closely resembles that of an additive resynthesiser - and, indeed, there is additive synthesis at its core, though here the developer has employed its AI algorithms to govern and control the vast number of parameters involved, creating a sort of giant 'macro'. The interface centres on a trio of 'tone colours', placed at corners of a 'Morph Triangle'. Out of the box, there are 152 tone colours from which to choose, including basics like pulse and sawtooth waves, electric pianos, basses, woodwinds, synthesised sounds and many, many more. Alas, you can't make your own tone colours, though. Each of these loaded sounds can be tweaked and played individually, but the real power of Einklang comes from its sophisticated morphing function, enabling the three tone colours to be blended by moving the central 'gem' around the Morph Triangle. In practise, it's rather like a cross between a vector pad and an X/Y pad, and the results bear some resemblance to resynthesising instruments like Camel Audio's Alchemy. Einklang's other synthesis parameters are divided into three sections: Timbre, Loudness and Modulation. There are two Timbre controls - one sets the amount of Dissonance applied, the other controls Harmonicity. Adding Dissonance results in a detuned sound that still retains some semblance of pitch, while reducing Harmonicity brings in inharmonic, noisy elements. The Loudness section houses familiar Attack and Release envelope controls, plus a Percussion parameter that reduces the sustain level and the length of the Attack and Release envelope stages. Synthesis doesn't get much more basic than this. Finally, the Modulation section consists of a Portamento function and an LFO. You only get control over the LFO's Intensity and Rate and there's no host sync available. The waveform sounds quite sine wave-like, but in actuality it changes depending on the tone colour in play. Unfortunately, there's also no means to route the modulation to targets other than pitch and amplitude, which feels like a miss - we wish it were possible to modulate the movement of the gem around the Morph Triangle, for example. Einklang is easy to use and sounds great. Strange, hybrid timbres are its forté, obviously, and it's brilliant for pads - assuming you don't mind animating them with DAW automation. And therein lies the problem: it's so simplified that it may well turn advanced sound designers off, which would be a shame, because they'd be missing out. Einklang's ability to produce unique timbres at a very fair price make it a welcome addition to the soft synth landscape.